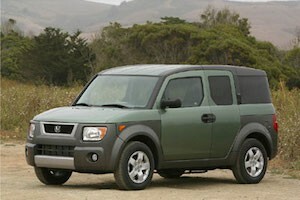 If you are looking for the best price on a used Honda Element in Smyrna, GA visit our used car dealership. Our used car inventory frequently includes bargains on used Honda Elements and other pre-owned Honda vehicles. Our used car and truck inventory offers a wide array of pre-owned vehicles from a variety of manufacturers. Chances are we have exactly what you are looking for. Our used vehicle selection always includes a wide variety of used cars, trucks and SUVs such as the Honda Element. Special offers and dealer discounts are frequenlty available to help you save money and reduce your monthly car payments. Be sure to visit the special offers page to see our very best pricing. Our used car financing team is on standby to help you find affordable auto loans or financing. Even if your credit is less than perfect we can help you drive away in the right car at the right price. So why not stop by and see our selection of bargain priced used Honda Elements near Smyrna, GA?